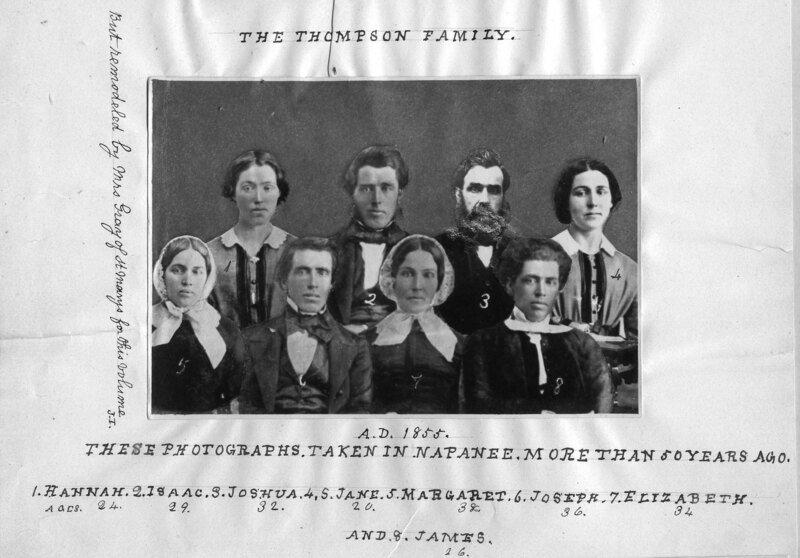 Family portrait of Dr. Charles Walden Thompson, Joshua’s son. Joshua confesses some of his own faults – his quick temper, for example, apparently a family trait; others can be deduced through his writings – pride perhaps. Still, his tone is reflective and contemplative – that of a man looking back on his own and his family’s life in the hope of creating a legacy. His zealous pen cannot conceal the deeply felt grief for parents, siblings and children long dead, or his obvious pride in his surviving children and grandchildren. In undertaking this great task, Joshua’s motivation must have been love; indeed, he loved his family so much that he dedicated years of his life revisiting a great deal of loss and sorrow by creating a written record to preserve their legacy for them, and for their descendants. 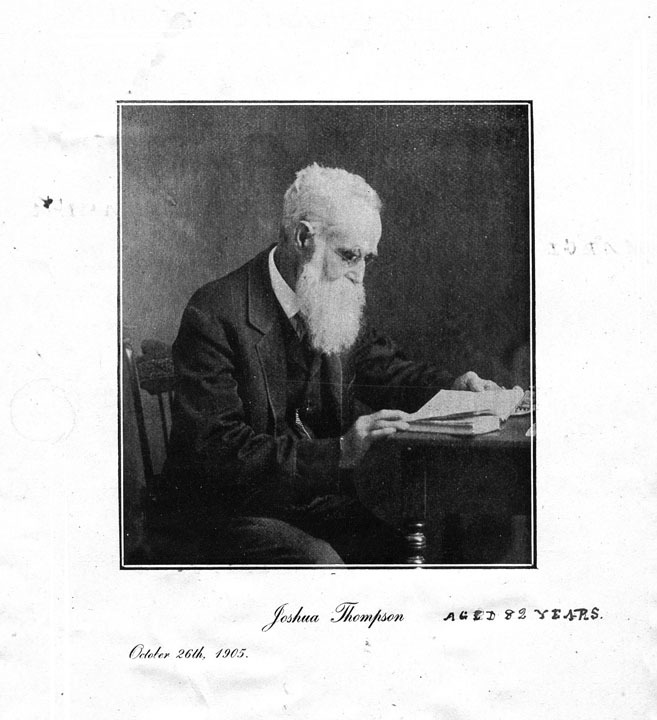 Some brief updates and notes appear in the manuscript, made by Joshua, and later by his son Dr. C. W. Thompson. They end around 1920. Long exposures in early photography made it nigh on impossible to pull off group portraits, so sitters were shot individually and a then grouped as a composite. 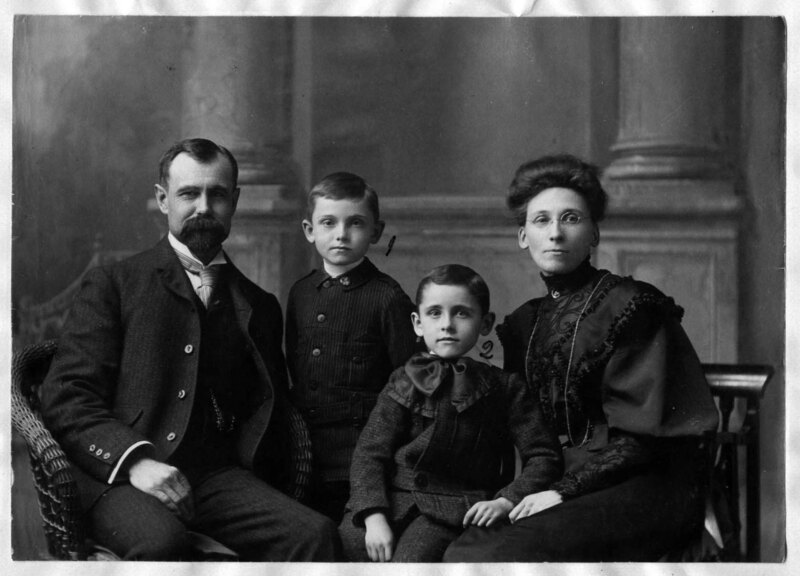 Joshua enriched his work with rare photos of his family. As with many vintage photographs, these have an eerie sense of time long past and yet preserve the dignity of the sitters. Best of all, these faces have a name and a story, unlike so many vintage photographs of anonymous faces found in abundance at flea markets and auctions. Occasionally, Joshua will make an allusion to some past dispute or scandal in the Thompson family, but as a rule he is averse to gossip. This leaves some intriguing silences in the text: tantalizing hints of untold stories. Conversely, he is often quite courageous in recording events that might daunt other chroniclers: the devastating mental illness of his father, for example, or the final moments of his brother’s gruesome death from tuberculosis. Having lived long and suffered much, Joshua found it easy to dwell on darker subject matters. That, and Joshua’s strict moral rectitude hardly makes the Family History a vehicle for wanton humour – at least, not humour intended deliberately. No contemporary reader can overlook Joshua’s own strong religious bias. The entire work is steeped in fundamentalist Methodism and a fiery sense of Christian righteousness, complete with the intolerance one might expect from this kind of fervor. Readers are treated to regular spasms of zealous outburst, usually sparked by some emotional event, ending with biblical quotations, allusions and sermons. He records that the Family History is not his first writing project of substance. Apparently, a hefty manuscript of religious writing and opinion had earlier been sent off to the authorities in the Methodist Church (these were included in the copy of the Family History given to daughter Gertrude). Without doubt, Joshua had a heart inclined toward the pulpit. His feverish digressions may distract the reader, but they also hint at the rigorous faith and emotion behind his need to record facets of his life and those of his family. 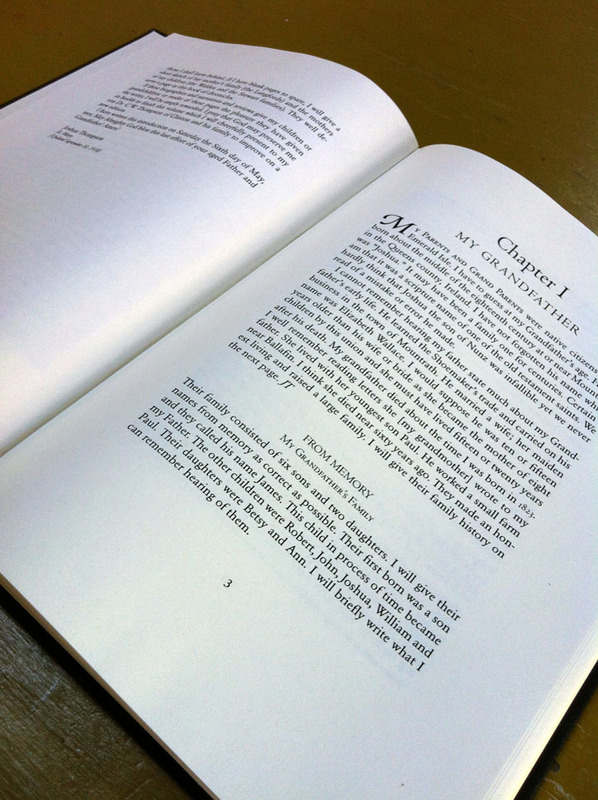 My next several blogs will cover a personal book project that has been in the works now for about fifteen years. Over a hundred years ago, my great-great grandfather, Joshua, wrote down his family’s history from their arrival in Canada in 1821 until 1907. He was 81 years old. 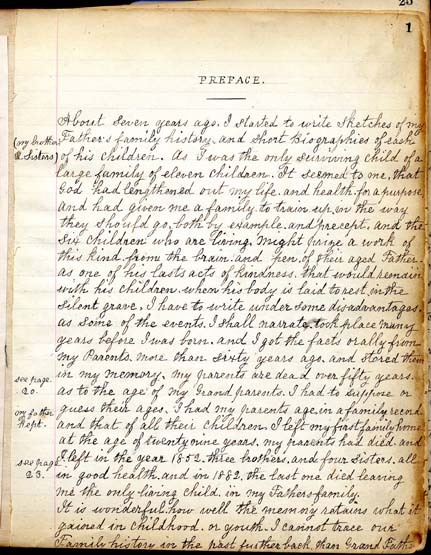 The hand-written manuscript is 240 pages long, and he likely did as many as four copies, one for each of his living sons. I remember seeing the old manuscript book under the side table that stood beside my grandfather’s armchair; I remember turning the pages, marveling a the delicate handwriting, and the ancient photographs of relatives now distant in time. Then, as now, it seemed extraordinary to me that anyone would undertake such a project. The book had been handed down from son to son, then ultimately to my father. 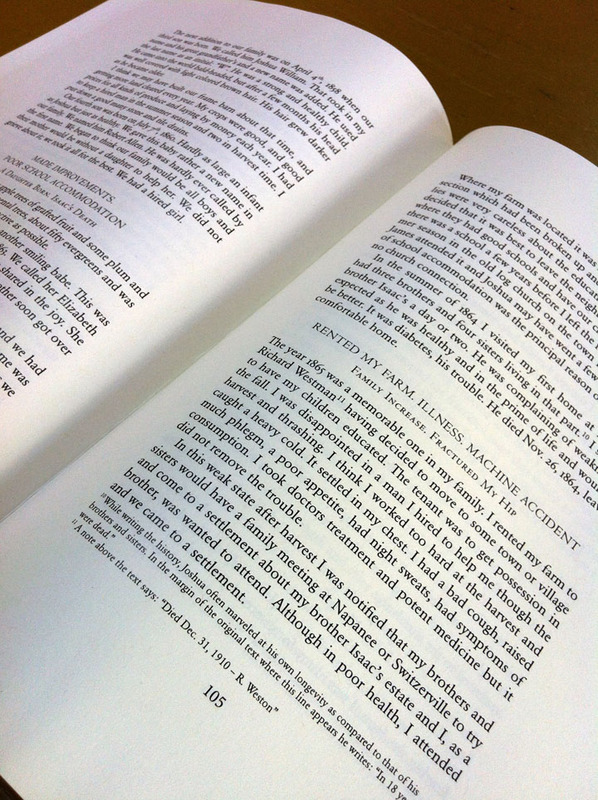 In the mid 1990s, during one of the periodic bouts of unemployment that the self-employed seem to experience, I pitched the idea to my father that we transcribe the History into text on the computer, then replicate it either as files or print-outs for the benefit of family and relatives who would undoubtedly be interested in their genealogy. Time passed and I revisited the project now and then. 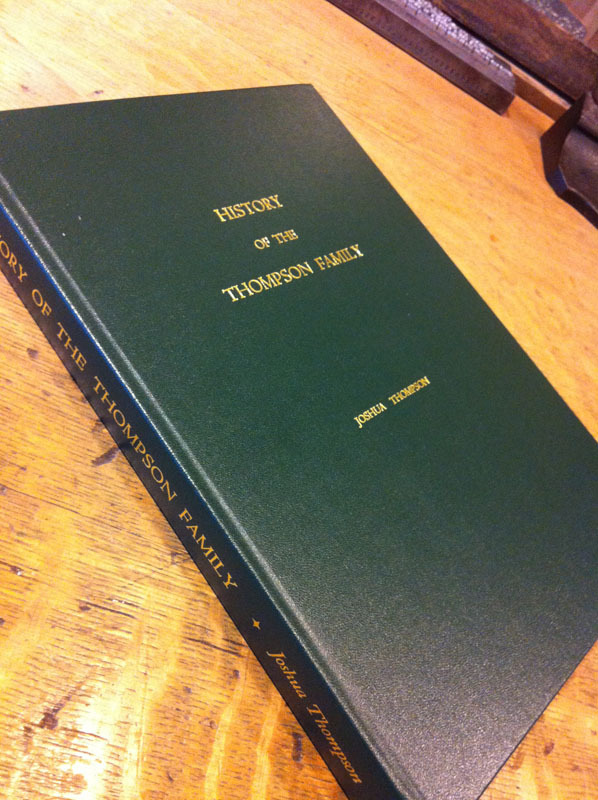 My interest in book design meant that, inevitably, the project would evolved from a mere transcription into a printed and bound edition, ultimately completed this fall. 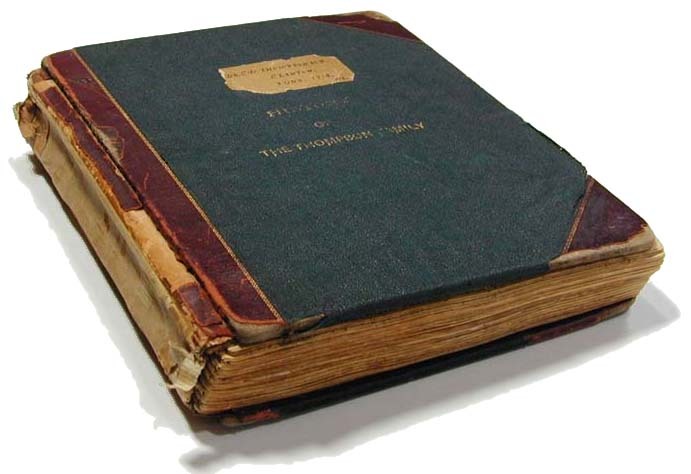 The next few posts will be dedicated to the History, the man who wrote it, some of the information in it and a bit about the production of the new edition and the restoration of the original manuscript.